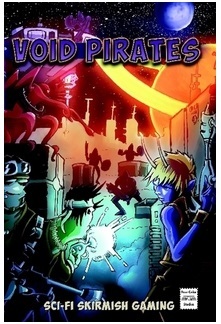 Void Pirates presents a Sci-Fi skirmish miniature battle game using a streamlined version of the Goalsystem rules. Use whatever miniatures you own to play out exciting skirmishes in any future world! Build crews with as few as two miniatures, or as many as seven. These rules work in any scale between 10mm - 54mm, and offer flexible and fun character creation, furious combats, and rewarding campaign play. Gather your friends, a handful of six-sided dice, and your favorite miniatures, and blast-off for Sci-Fi fun! David Ross 9 8 9 Fast, open to figs I have, and with sci-fi flavor. There is a story in our games.